Wong has undoubtedly benefitted from the diversity of opportunities. 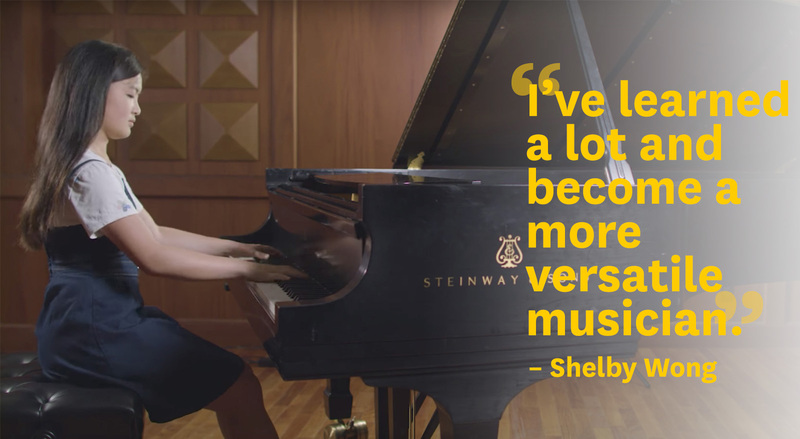 With a major in Piano Performance at USC Thornton School of Music and a minor in Business Law from USC Marshall School of Business, she still finds time to pursue other passions. In addition to piano, Wong also plays violin. “When I came here, I didn’t want to stop,” she recalls. “I was looking for ways to keep my involvement up.” To stay sharp on her second instrument, she enrolled in non-major lessons, joined the USC Thornton Symphony, and performs with – and is the president of – the student-led USC Concerto Chamber Orchestra. Shelby Wong (left) performing as a soloist with the USC Concerto Chamber Orchestra. But her interests don’t end there. She enjoys collaborating with USC students at the School of Cinematic Arts and the Glorya Kaufman School of Dance. And not to be limited to two instruments, she recently enrolled in viola lessons to complement her violin practice, and just started organ lessons as well, “an opportunity I had never thought would be possible,” she says. As for her minor in law, the junior hasn’t decided if she’ll pursue it as a career. She’s using this time to learn about the field. Someday soon, she’ll have to choose a path, but for now, she’s glad to have found an environment where exploration is encouraged. “My professor, Kevin Fitz-Gerald, he’s been really understanding about my interest in doing multiple things, instead of just focusing solely on my major,” she says. Wong, who turned 19 in December, skipped her final year of high school through the USC Resident Honors Program. USC Thornton continues to challenge her while satisfying her curious intellect. Click here to learn more about USC Thornton’s new, cutting-edge curriculum for classical music education.